On the lack of A/C in the immediate Astrodome renovation plans: It's not as crazy as it sounds. The primary use is the Rodeo and OTC, both in the spring, so good airflow probably adequate until there is a revenue stream to afford a new A/C system. The 15th Annual Demographia International Housing Affordability Survey: 2019 (Rating Middle-Income Housing Affordability) has been released (New Geography coverage here and here). As always, Houston ranks quite well, scoring a 3.7 this year in the ratio of home prices to median incomes. The New Zealand government report I was interviewed for on creating more competitive urban land markets down there has been released. They may potentially adopt something similar to our MUDs. NZ has a horrendous housing crisis because of lack of development, and hopefully the government will be taking bolder steps to address it through new incentives for private development. Hat tip to Chris. Deregulate land. In hot markets, this will lead to rapid construction & price stability. Take Houston: since 2010 it's #2 in population growth, but #1 in permits - maintaining price medians below the US average." More from the Market Urbanism Report: Why is Austin the most expensive big city in Texas? Home prices are growing higher and faster in Austin than other Texas cities. The cause is regulation. And one more from MUR: Does adding expensive housing help the little guy? According to our analysis, expensive housing helps not only the little guy but every other income group. Joel Kotkin discusses how Houston and other affordable cities are actually beating the superstar cities for tech jobs. Excited to see the potential for MaX Lanes inside the loop on I10. In fact, the four largest Texas metropolitan areas, Dallas-Fort Worth, Houston, San Antonio, and Austin each have median lot sizes of from 0.18 acres to 0.25 acres, small or smaller than Philadelphia, Boston or Washington. The market orientation of Texas land and residential development have not resulted in less efficient use of land." "It’s noble to want to make America’s streets as safe as they can be. But government officials shouldn’t impose projects on communities that don’t work, inconvenience residents, hurt businesses and impede emergency responders in the process." Finally, new County Judge Lina Hidalgo has put out a survey to the public to help set the priorities for her administration. I encourage all my readers to fill it out here. 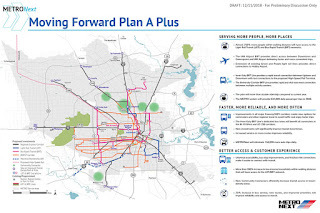 METRO recently released a draft $7.5 billion 2040 transit plan they’ve labeled “A Plus” (the previous “A” plan plus some additions), but unfortunately it’s more like a B- when it comes to addressing Houston’s real transportation needs over the next two decades. It has some wonderful, cost-effective local and express bus improvements – including bus-rapid transit (BRT) at less than one-third the cost per mile of light rail – but continues to throw mountains of good money after bad on wasteful new light rail extensions. Unfortunately we're already all too familiar with low ridership on light rail. The $1.4 billion Green and Purple lines have dismally low patronage, with only 5,077 weekday boardings on the Green Line and 7,416 weekday boardings on the Purple Line. For comparison, the Main St. Red Line has 53,412 weekday boardings, and the Katy Freeway near Beltway 8 served 366,000 vehicles carrying a half-million people per day in 2017. Beyond the wasteful cost-inefficiency, rail is also at significant risk of technological obsolescence as autonomous vehicles and shared-ride services like Uber, Lyft, and Google’s Waymo continue to evolve. The impact of new technology on public transit is unknown but could be hugely disruptive, potentially substantially reducing demand for traditional public transit. That’s why we need a plan which is adaptable to whatever the future may bring. For future planning purposes and METRONext, it really does not matter if autonomous vehicles become available in 5 years or decades in the future. Anything built in the MetroNext plan can be expected to be in service to the year 2100 and beyond. METRONext needs to be ready for autonomous transit, if and when it comes, but also maximize mobility benefits of transit investments if autonomous transit is slow to develop or has a minimal impact. Practically, that means concrete guideways with rubber-tired vehicles that can evolve as the technology does. Equity: LINK Houston recently released a report estimating almost a million Houstonians need better basic bus service. 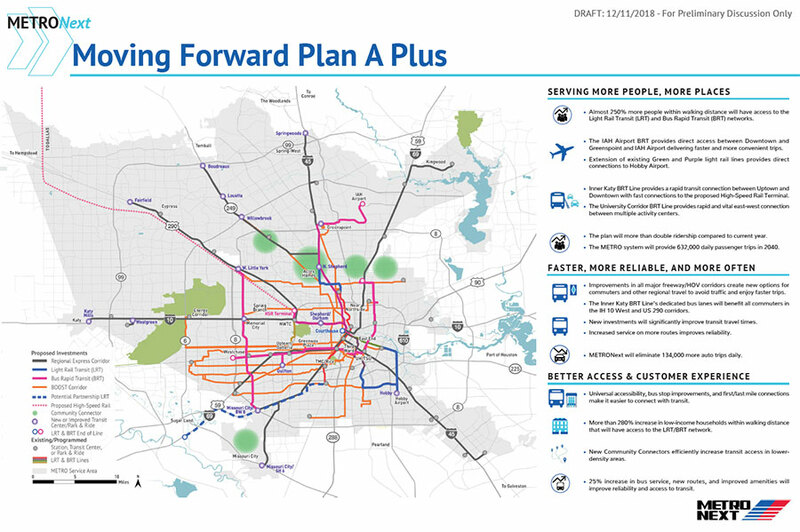 The METRONext plan calls for 241 miles of BOOST network bus service with higher frequencies, better reliability, and sheltered stops for the bargain cost of only $53 million ($220k/mile). Why not dramatically expand that to more of the city? Are there measurable benefits from Complete Streets? "State DOTs should be far more cautious in agreeing to requests from municipalities to convert arterial routes to Complete Streets treatment. Most of the information provided by New Urbanists consists of anecdotes, rather than careful analysis such as Vandegriff and Zandoni have provided." "After Hurricane Harvey, the city is back on its feet and showing off the everything-is-bigger-in-Texas attitude. Four food halls opened in 2018, including Finn Hall, which features up-and-coming chefs including the James Beard-nominated chef Jianyun Ye with a downtown outpost of his Chinese hot spot Mala Sichuan and a taqueria from the local favorite Goode Company. The five-diamond Post Oak Hotel opened in March 2018 with a two-story Rolls Royce showroom, art by Frank Stella and a 30,000-bottle wine cellar. The Menil Collection, known for its eclectic art ranging from Byzantine antiques to 20th-century Pop Art, underwent a seven-month renovation of its main building and opened the 30,000-square-foot Menil Drawing Institute. The low-slung white steel-and-glass building with a trapezoidal roof is the first addition to the Menil campus in 20 years and the first freestanding museum dedicated to modern drawing in the United States. The city’s museum boom continues with a massive expansion of the Museum of Fine Arts, Houston to be completed in 2020, a newly built location for the Holocaust Museum, which will move in the spring of 2019, and a restoration of the Apollo Mission Center that will open in time for the 50th anniversary of the moon landing in July." "Transit riders are more sensitive to frequencies than to whether a transit vehicle runs on rubber tires or steel wheels. A bus carries fewer people than a train, but that’s a virtue, not a flaw, because it allows for higher frequencies. If Ft. Worth had used buses rather than rails for this route, it could have run those buses every 10 or 15 minutes (instead of hourly), attracting a lot more riders." Another Antiplanner where he defends Houston from the NYT story "Don't be like... [insert city here]"
"Houston is a city of immigrants and engineers. Function trumps fashion with this no-nonsense crowd that expects to work hard and earn rewards based on merit. Looking at demographics and migration patterns, people voting with their feet consider the Bayou City the most egalitarian of the Texas metro areas." Pretty cool cost of living maps by neighborhood, inc. Houston (which does quite well). Hat tip to Judah. Glad to see efforts here to broaden our base as the Energy Capital of the world. Higher Rents Correlate to Higher Homeless Rates, New Research Shows. Hat tip to Leo. Houston again takes crown for No.1 party spot in the U.S.
A little humor in our last bullet: Evidently, Utah hates the Rockets, lol. Finally, I wanted to end with a longer set of excerpts from an excellent piece by Nolan Gray in CityLab: "How Cities Design Themselves"
"Sometimes when I read the papers of my fellow urban planners, I get the sense that they think cities are Disneyland or Club Med. Cities are labor markets. People go to cities to find a good job. Firms move to cities, which are expensive, because they are more likely to find the staff and specialists that they need. If a city’s attractive, that’s a bonus. But basically, they come to get a job. Urban planning has an important role to play. With the exception of fire and safety regulation, planners should focus much less on what people do on their plot or in their apartment, and much more on the management of the public spaces, like streets and parks. Insomuch as urban planners deal with land uses and densities, they should closely monitor trends to be aware of what’s happening. For instance, in New York, household size has plummeted over the past 30 years. Urban planners should be aware of that and address rigidities that prevent the city from accommodating those demographic changes. An area where urban planners should play a much more active role is mobility, mainly by adapting existing systems to emerging trends. Urban mobility is the key to housing affordability. Improved urban transport makes more land available for housing and therefore allows low-income people to live in areas that are both affordable and accessible to most of the city. In my book, I talk a lot about income distribution curves. Every time urban planners do something, they should ask: Who is going to pay?"